Microsoft India, in association with Times of India and Lodestar Universal has launched a security campaign to help computer users identify threats to their systems and to make their computer networks more secure using Genuine Windows 7 and Microsoft Security Essentials which is a free Anti Virus software for Windows 7. 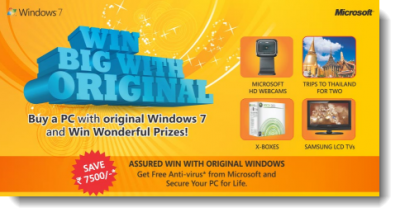 The ‘Win BIG With Original’ will be targeting IT hubs across the following cities cities: Bangalore, Hyderabad, Chennai, Indore, Ahmedabad, Surat and Patna during the 30-day-long campaign. Microsoft Security Essentials is available for free for genuine Windows software and it delivers a trusted security solution across the Windows and helps consumers enjoy better & safer Windows experience. The MSE Robot has been reincarnated and will be seen across various IT hubs not only reinforcing the benefits of using genuine Windows 7 software but also reinstating counterfeit discs and propagating promotional offers like trip to Thailand, LCD Television, X-boxes on Purchase. You can check out details on WindowsAndMe.com.